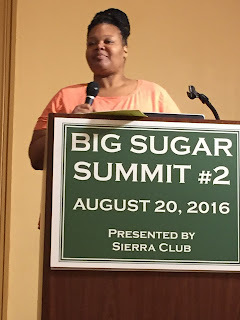 Photo by Leonard Durham Bryant, Jr.
More than 250 people crowded into a packed ballroom last week to hear experts and activists deliver the uncoated truth about the sugar industry at the Big Sugar Summit 2 in West Palm Beach. In the day-long conference, 36 speakers in eight breakout session, ranging from the politics of Big Sugar to the economics of the Everglades Agricultural Area, gave insight into one of the most influential and polluting industries in America. New voices and perspectives shared at this year’s summit sent an undeniable message to Big Sugar, and all those in attendance, that the grassroots movement against Big Sugar’s corruption has broadened and strengthened. Sierra Club Florida Director Frank Jackalone kicked off the Summit with a talk called “Winners and Losers (for now)” It focused on industry’s owners, its global ambitions, and its influence on Federal and State policy. He contrasted the billionaire winners with the financially-struggling communities around Lake Okeechobee, ravaged coastal cities and a dying Everglades. Charles Kropke or Tropic Moon Holdings. Documentary maker and tour operator Charles Kropke of Tropic Moon Holdings, then gave a presentation on the natural history of the Everglades ecosystem and Florida Bay. He compared the old “river of grass” to its current state and how development, lack of fresh water flowing south, and Big Sugar’s industrial farming practices in the EAA threaten the future of the vital Everglades ecosystem. Captain Mike Connor of Bullsugar.org laid out the devastating economic toll the blue-green algae blooms have had on the fishing and tourism industries on the coasts in the past few years culminating in guacamole-thick algae making international headlines this summer. He described how the once world class fisheries of the St. Lucie Estuary and Florida Bay have been depleted by massive fish kills and a near ecological collapse because of the ongoing water quality crisis. He said business owners like himself, who have relied on the waterways for their livelihoods, are now being forced to either move or shut down while Big Sugar continues to profit and block long term solutions to the continuous discharges. The audience experienced the most emotional speech of the day when South Bay community activist and Stop Sugar Field Burning team member Kina Phillips spoke about the negative effects sugar cane burning has on the health and quality of life for citizens within the Glades communities in Western Palm Beach County. She pointed out the injustice of how current burning restrictions only prevent burning when the wind blows from the west towards eastern Palm Beach County, but no protection at all is in place when winds blow smoke and ash upon the Glades communities in the western part. Kina said her community will no longer remain silent to such injustice. She described how the campaign aims to pressure the Big Sugar to become a better neighbor to the residents of the Glades communities by adopting green-harvesting, a smoke-free harvest method that would protect Glades community residents and bring new economic opportunity to the region. Her speech ended to the backdrop of thunderous applause as she encouraged attendees to “have a voice and a choice” and sign the newly released Western Palm Beach County Stop Sugar Field Burning Petition. Miccosukee Tribe Water Quality Director Gene Duncan said the tribe used its sovereign authority to become the first region in the Country to set water quality standards for phosphorous, long before similar standards were adopted by Florida. He said action is needed to reduce nutrients throughout the Everglades watershed. those in the pocket of Big Sugar. Mary Barley, chairwoman of the Everglades Trust, touted the success of the Now or Neverglades declaration which has urged politicians to act in favor of Floridians and not Big Sugar interests. She lauded Senator Negron’s recent EAA land purchase proposal as a positive example of grassroots efforts fueling bipartisan political will. She urged the public to vote for clean water supporters, regardless of party affiliation. Leslie Fields, director of the Sierra Club’s National Environmental Justice Program, expressed how touched she was by her tour of the Glades communities the previous day. She explained how shocked she was to find out sugar cane burning took place right up to the fences of elementary schools and people’s backyards in South Bay. She tied in similarities of the Stop Sugar Field Burning Campaign to her environmental justice work done elsewhere in the nation with poor minority communities such as in New Orleans. She emphasized the importance of incorporating just transition work into environmental campaigns to ensure economic support for displaced workers coincides with campaign goals. Just transition, as Leslie described, is about solidarity and ensuring no single community bears all the burdens or reaps all the benefits. The audience also fanned out to break out panels, which included Sugar Field Burning, the St. Lucie Estuary, the Caloosahatchee Estuary, Everglades National Park/Florida Bay, Political Influence on the State/Local Level, the Federal Sugar Program, the Economic Future of the Everglades Agricultural Area (EAA), and Health Impacts. The panels provided a great educational opportunity where each attendee was able to attend two different panels, listen to experts give brief presentations, and participate in detailed discussions regarding the panel specific topics. There was also an "open-mic" session and a "taking it home" session, in which audience members received information and resources to spread the word and build the coalition. Sierra Club's Frank Jackalone closed the Summit by reflecting upon how much stronger the movement against Big Sugar has grown since last year’s Big Sugar Summit. With the launching of new teams, new petitions, and the inclusion of new perspectives into the movement, the summit ended in an atmosphere of optimism for the future where everyone left knowing the movement is growing stronger and all present had taken a big stand against Big Sugar. To join our sugar campaign, send an email to cris.costello@sierraclub.org with your phone number, address and area of interest. ATLANTA, GA – Today, Gulf Restoration Network (GRN), Flint Riverkeeper, and the Sierra Club filed a lawsuit in the U.S. Eleventh Circuit Court of Appeals against the U.S. Army Corps of Engineers for its issuance of three Clean Water Act permits that would allow construction of the 515-mile Florida Southeast Market Pipelines Project, including the Sabal Trail pipeline. This project would transport fracked gas across 699 waterbodies, lakes, rivers, and streams and harm 1,958 wetland systems in three states: Alabama, Georgia, and Florida. GRN, Flint Riverkeeper and Sierra Club are represented by Jim Hecker at Public Justice in Washington, DC and Steve Caley at Greenlaw in Atlanta, Georgia. The Sierra Club is America’s largest and most influential grassroots environmental organization, with more than 2.4 million members and supporters nationwide. In addition to creating opportunities for people of all ages, levels and locations to have meaningful outdoor experiences, the Sierra Club works to safeguard the health of our communities, protect wildlife, and preserve our remaining wild places through grassroots activism, public education, lobbying, and litigation. For more information, visit http://www.sierraclub.org. Just released! 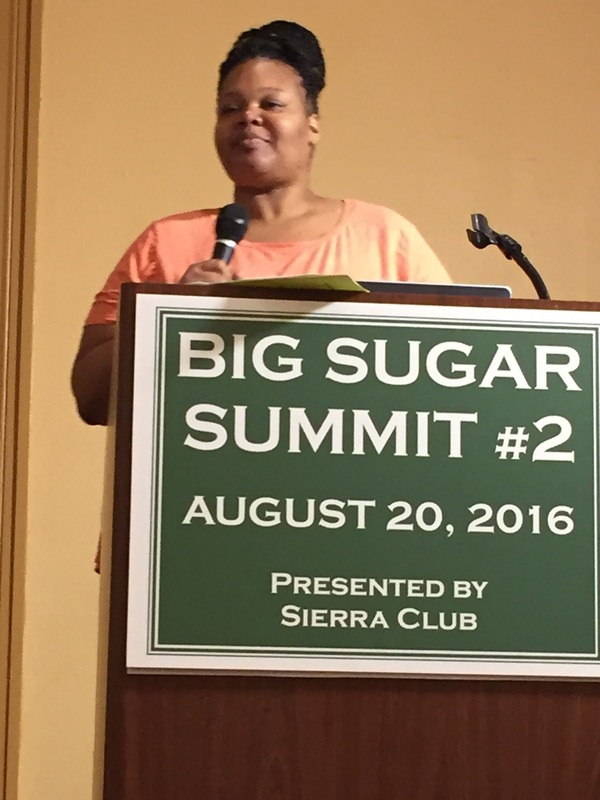 Full agenda for Big Sugar Summit 2 on Aug. 20, 2016 in West Palm Beach. Register now! in West Palm Beach on Sat., Aug. 20, 2016. Register by clicking HERE. Hurry, seating is limited! Today, Florida Senate President-designate Joe Negron announced a plan to restore the Everglades by buying 60,000 acres of sugar land in the Everglades Agricultural Area to store water and send it south using Amendment 1 money to finance the state’s contribution. We applaud Senator Negron’s bold leadership to truly find a solution to the algae crisis and help restore America’s Everglades. Senator Negron’s plan proposes a significant amount of land for the water storage and treatment needed to protect our communities and to restore the natural flow of the Everglades from Lake Okeechobee south to Florida Bay while replenishing our aquifers. This proposed purchase will leave most of the farm land in the Everglades Agricultural Area intact while adding thousands of well-paying construction jobs. It will keep Lake Okeechobee from spilling over during the rainy season and protect the lives of those who live next to the Herbert Hoover Dike. At the same time, it will provide an additional 120 billion gallons of water storage that will protect our coasts from massive marine die-offs and the unprecedented threats to human health from nutrient-loaded Lake Okeechobee discharges. Sierra Club will review all aspects of Senator Negron's proposal as details materialize, but this appears to be a major breakthrough. before moving it to the Everglades. We urge Governor Scott and the Legislature to adopt Senator Negron’s plan to end this crisis and to immediately join the U.S. Army Corps of Engineers as sponsors of the planning process for water storage south of Lake Okeechobee. Following Senator Negron's lead, Governor Scott and the Florida Legislature can restore the Everglades, end the algae crisis along our coasts, and build a stronger economy in the Glades communities.